Since its introduction into Australia in late 2013, FlexTube is fast becoming the access cable of choice for some of Australia’s largest Telcos. Network operators are enticed by the cable’s compact design and fast fibre access. The cable benefits are best utilised in the access network, in congested urban environments with close proximity to the end user, where the benefits of a compact design and fast termination are best realised. Two Australian Telcos have been using FlexTube since its Australian introduction. This paper presents a closer look at their networks and the reasons for their wide-scale adoption of FlexTube. 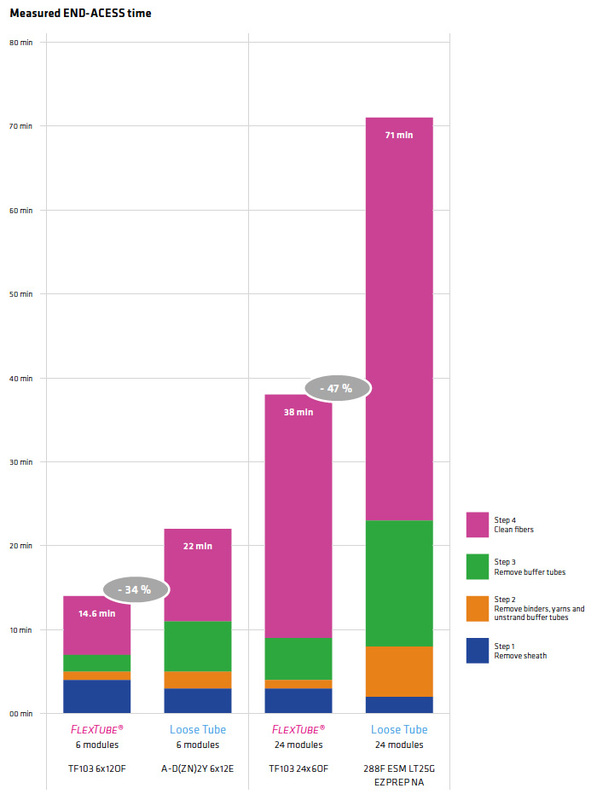 One leading Australian ISP Telco builds a majority of its network in rented ducts which cost between $6 – $12/m per year depending on their size and location. The ducts are often partially occupied with previously installed cable, which significantly reduces the amount of vacant space and potential for further cable deployment. The company’s main challenge is to reduce OPEX whilst expanding their fibre network by better utilising existing duct infrastructure. FlexTube’s high fibre density design fits this requirement perfectly. 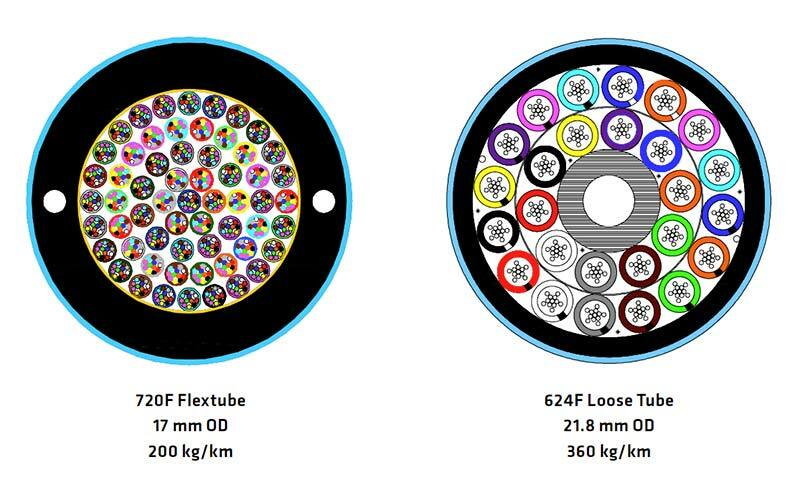 For the same cable diameter, FlexTube offers a significant increase in the number of fibres that can be installed, dramatically decreasing per fibre install cost and per fibre duct leasing cost. Where duct space is particularly limited, FlexTube can offer reduced duct space for the same number of fibres, resulting in deployments in ducts that may otherwise not be possible. FlexTube also has the added benefit of faster fibre access when terminating and easier tube management when jointing. Cable termination and jointing are common practices in the access network where high fibre count cables are broken down and redistributed into multiple lower fibre count routes. FlexTube makes this process easier and also enables smaller form factor joints to be used as tubes and fibres can be stored in a smaller housing, reducing pit congestion. In this case, the main distribution cable is the 720F FlexTube cable; it forms the main distribution ring within the Telco network. Being able to deploy a 720 fibre capacity cable in partially occupied duct is pivotal to the success of the architecture. It provides redundancy and scalability in order to meet future demand. Without the density of FlexTube new vacant duct would need to be installed, further duct space rented or reduced fibre capacity deployed. Installing new conduit can cost up to $1500/m in the Sydney CBD and pits can cost up to $10,000 each. Being able to utilise existing infrastructure rather than building new is a major advantage when aiming to keep build costs to a minimum. Before the 720F FlexTube cable was available the next best alternative was Prysmian’s 624F Loose Tube cable. At over 60% larger in cross-section and 80% heavier, the 624F cable was far more difficult to handle and took up a lot more space inside conduits. 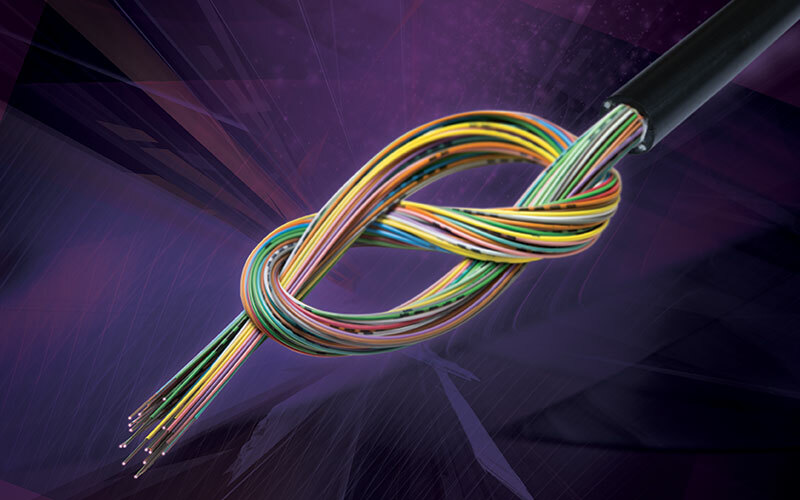 The 720F FlexTube cable not only offers nearly 100 more fibres but also leaves enough remaining space in the conduit to over-haul additional lower fibre count cables which make up the access network. This not only increases the duct utilisation but also adds flexibility to the network architecture. How does FlexTube measure up – 720F FlexTube vs 624F Loose Tube Cable. Image not to scale. Telco’s also sees real value in the faster cable preparation and easier handling offered by the FlexTube design. Fibre access is 40% – 50% quicker compared with conventional Loose Tube cables. The fibre modules inside FlexTube can be removed by hand and contain far less filling gel, greatly reducing the time required to access, clean and prepare the fibres for splicing. The smaller cable cross-section enhanced flexibility and light-weight design also mean the cables are easier to handle and haul. These value-add features enable Telco’s to negotiate better rates with their installers, reducing the installation and termination costs. Another Australian Telco (a dark fibre and internet services provider) has built a substantial fibre infrastructure using a host of installation techniques for deployment. They both rent and own duct space and tend to blow low fibre count cables into micro ducts, which are installed into existing conduits, while higher fibre count cables are hauled. In order to optimise their network and reduce CAPEX, the Telco wanted to improve duct utilization. FlexTube satisfied this requirement perfectly. By using cables with a reduced external diameter, higher fibre count cables could be installed and lower count cables could be blown greater distances, making the installation process more cost effective and efficient. Having the ability to install additional cables over existing services is a major advantage of FlexTube. In this case it provides the Telco with flexibility to increase network capacity in high demand areas, preventing bottle necks and enables redirection of the network in order to service new areas. The high density FlexTube design is a perfect over-lay solution. New cables can be blown or hauled inside partially occupied conduits without removing or interrupting the existing services. This would simply have not been possible with larger diameter Loose Tube cables. The small diameter FlexTube design also increases the blowing distance that can be achieved, leading to faster cable installation and less cable jointing. In order to satisfy a growing demand for designated fibres and bandwidth between two data centres, this Telco required a cable with the highest possible capacity for a direct, low latency connection. The cable needed to contain a large number of fibres but be flexible and small enough to be installed in existing conduit. Prysmian designed a special FlexTube cable, containing 1728 fibres in a 23mm diameter cross-section – it exhibited record-breaking density and contained Prysmian’s advanced bend insensitive 200µm fibre. Network reliability is also a top priority for this Telco. The soft modules inside FlexTube cables are impervious to kinking. Tube kinks in conventional Loose Tube cables can unknowingly occur during cable termination and cause significant signal attenuation or even fibre breaks. This interrupts services and results in expensive remediation works. Removing this threat from fibre deployment is another advantage this Telco sought to exploit by moving to FlexTube technology.